John Atkins : Canoes and Fishing, Guinea and Brazil, 1735. 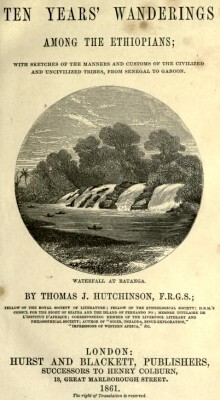 A Voyage to Guinea, Brasil and the West Indies. C. Ward and R. Chandler, London, 1735. Atkins writes that the Guinea coast, except a few major headlands, is "very straight without bays or inlets," with "the surf breaking all along to a great height, by means of a continued swell from a vast Southern Ocean." They "count the seas, and know when to paddle safely on or off," apparently without danger, as Atkins "imagine(s) they can swim." He notes that the coast at Whyddhy is particularly dangerous, with a consistant swell breaking on two sand bars and, on one occasion, when a canoe capsizes when attempting to land shark seized upon one of the crew. Although they were together cast ashore by a wave, the shark held its grip and with the next swell, returned to the sea with its prey. Fonchial Road is similarly dangerous, with anchorage a mile or mile and half off shore. The appearance of "an extraordinary surf on the beach" is a sign foretelling the approach of a hurricane. Canoes are the main transport for passengers and freight along the coast. They are shaped from "a sigle cotton-tree, in the shape of a boat ; 8 or 10 foot broad, carrying twenty rowers." Atkins reports that canoes, which"will carry 200 men," with matted sails and cordage twisted from a local wild vine, regulary sail from Congo to Loango. Using paddles, they face forward, and stroke "together with dexterity," and when carrying a European sing in unison as " a mark of respect." At Cape Corfo on the Gold Coast, Aiktins reports that in fine weather, thelocal fishing fleet numbers from 40 to 100 to canoes. Unclear of how the Africa traders accquire elephants tusks, Aiktins does note that the rivers provide access deep into the interior and there are regular trading excursions by canoe, "like the (native) Americans." Each native is said to have a personal "fetish," a small effergy held in the house, in canoe, or about their person. At Cape Corfo, a bluff peninsula prominence that juts out from the bottom of the cliff provides a small shadow from the swell and is a recognised landing place, however it frequently has "the sea breaking over (it) with great force." Venerated as Tahra/Tabra, a public fetish for the local fisherman, Aikins claims that its status is related to the destruction of the local fishing fleet in a Southerly gale "about forty or fifty years ago ...on a Tuesday." The manatea is a prized catch, speared from a canoe it retreats to the mangroves where the hunters kill the animal and drag it ashore. Aitkins describes the flesh as "white like veal" which can be served boiled, stewed, or roasted, and the taste comparable with venison. -also includes "water to eye" peace sign-page??? The spelling has been updated; in the original printing there is an overuse of capitalization, and "s" is regularly is transcribed as "f."
The appersan (&) is replaced here by "and," in the case of "&c," it is replaced by "etc." Sierraleon (Sierra Leon) River is very broad here, but in ten or twelve miles rowing upwards, narrow to half the breadth of the Thames at London, spread on both sides thick with mangroves and trees, or slender woody shrubs, that spring from the low, watery banks of rivers, in warm climates. alligator) which, with the sharks, very much infest the river. A story or two of these creatures, may not be unacceptable. end and that in 40 fathom, a mile or mile and half off shore : so that when a swell from those quarters gives notice of a gale coming, all ships in the road slip their cables and to sea, returning at a more favourable season for their lading: which likewise, by an extraordinary surf on the beach, becomes troublefome to ship off and commonly done by swimming the pipes (?) off to the launch, or laid on the beach, and run her with many hands into the sea. The like trouble boats have in watering (by a river at the W. end of the town) and is, most commodiously done before the sea-breeze comes in. The negroes way of taking them, is in a canoe which they paddle towards the manatea with as little noise as possible, (she being extremely quick of hearing :) when near enough, a man placed ready in the boat's head, strikes in his harpoon with a long pole into her, and lets go. She makes towards the mangroves immediately, and the water being shallow, they now and then get sight of the pole, and to follow, renewing the strokes till they kill, or weary her, and then drag her ashore. merchant-ship with some goods, and in attempting to land, overset : a shark nigh hand, feized upon one of the men in the water, and by the swell of the sea, they were both cast on shore ; notwithstanding which, the shark never quitted his hold, but with the next ascend of the sea, carried him clear off. The religion here, if it may be called such, is their veneration to Gregries (effergies?) : every one keeps in his house, in his canoe, or about his person, something that he highly reverences, and that he imagines can, and does defend him from miscarriage, in the nature oar country-folks do charms, but with more fear : and these things are very various either a cleaved piece of wood, a bundle of peculiar little sticks or bones, a monkey's skull, or the like. To these, every family has now and then a feast, inviting one another and but of this more, under the word Fetifa. and then at astand whether they should enter. The boldest would sometimes come on board, bringing rice, malaguetta, and teeth (tusks), but staying under fear and suspicion. Here we may take these observations. 1. Canoes are what are used through the whole Coast for transporting men and goods. 1. That the land from Sierraleon, except cape Apol- jng two or three Capes, and that about Drewin, appears low, and the first land you see (as the Irishman says) is trees and runs very straight without bays or inlets, which makes it difficult to distinguish, and impossible for us to land safely at ; the surf breaking all along to a great height, by means of a continued swell from a vast Southern Ocean ; a sea which the natives only underfsand, and can push their canoes through. This seems a natural prohibition to strangers, and whence it follows in respect to trade, that ships are obliged to send their boats with goods near shore, where the natives meet them, and barter for slaves, gold, and ivory for at many places a Grandee Shippee (as they call it) assrights (?) them, and they will venture then, as I imagine they can swim. making fo great a surf, nor could we do it by our own boats, but Canoos of his sending. ... they. Pumas. count the seas, and know when to paddle safely on or off. At this Cape Corfo on the Gold Coast, is Corfa, the principal Fort and Factory of our English Company, to which their ships constantly resort, and receive orders either by themfelves, or with supercargoes, where else to proceed. cavallocs, bream, cat-fish, etc.. all small, but in tolerable plenty and there being out in the road fishing, from 40 and 50, to 100 canoes, when fine weather. There is also at Cabo Corfo, a public fetifh; the guardian of them all and that is the rock Tahra, a bluff peninsula prominence that juts out from the bottom of the cliff the castle stands on, making a sort of cover for landing, but so unsafe, as frequently to expose the boats and people to danger, the sea breaking over with great force. They have canoes there, will carry 200 men and matted sails to them, and cordage twisted from a wild vine that grows in plenty about'the country ; with these they pass frequently from Congo to Loango. of Soiii, and the harmony they live in with a few defenceless Tortuguefe missionaries, shews they are a peaceable people. through the woods and desarts (? ), is uncertain. At the Seafon (once a year) they move their pavilions from the pleafurable spots, the better to attend the logwood cutting, which carries them fometimes many miles from this principal refidence, to follow the wood, which runs in a line or vein (like minerals in the earth) of some miles perhaps, and then as many, without a stick of it. are laden away with it, to lay in store at Barcaderas, where the Chief are still left residing. without reflux of the water and the two nights preceding, prodigious lightnings and thunder ; which all the old experienced men foretold would be a hurricane or that one already had happened at no great distance. Geoff Cater (2013) : John Atkins : Canoes and Fishing, Guinea and Brazil, 1735.